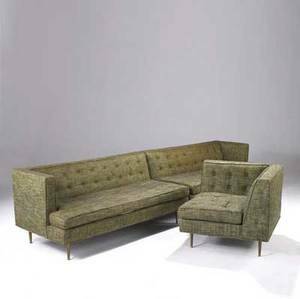 EDWARD WORMLEY / DUNBAR Early three-piece sofa suite consisting of a large left- and right-handed sofa, each with single arm, and a free-standing armless corner unit, with original hopsack upholstery on solid brass legs. 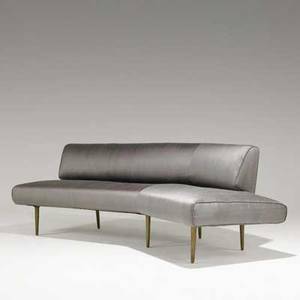 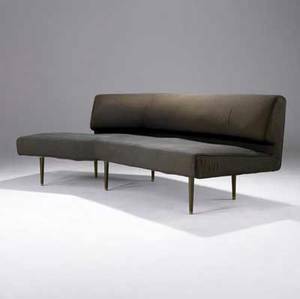 Left and right sections (each): 27" x 30" x 60", armless corner unit: 27" x 30 1/4" x 30 1/2"
Edward wormley; dunbar; early curved sofa on solid brass legs, original silk upholstery; green dunbar metal tag; 30" x 88" x 44"
Edward wormley; dunbar; channel-back sofa (no. 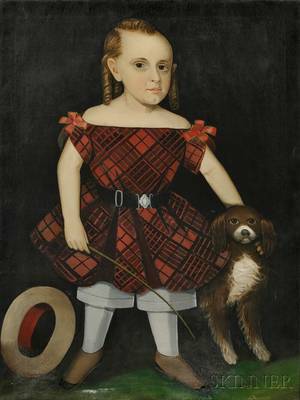 4757), usa, ca. 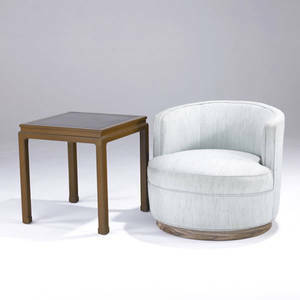 1947; brass and silk; unmarked; 29" x 90" x 45"
Edward wormley / dunbar barrel chair upholstered in mint green on swivel base and mahogany side table with black leather top. branded mark to table. 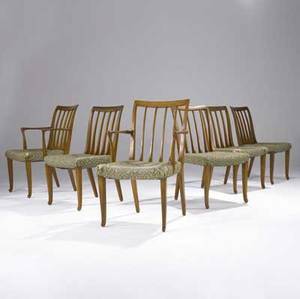 chair: 25" x 28" x 31"; table: 22" x 21 1/2" sq. 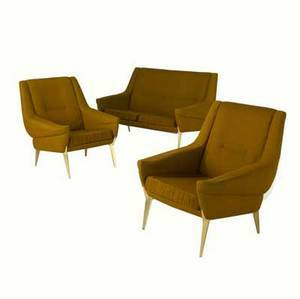 Danish modern three-piece furniture suite consisting of a settee and pair of matching armchairs, with amber wool upholstery and polished brass feet. 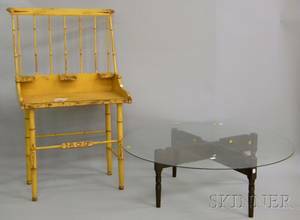 settee: 32" x 52" x 30", armchairs: 32" x 30" x 30"
Yellow-painted and Decorated Wooden Washstand with Bamboo Turnings and a Glass-top Coffee Table with Crossed Turned Wood Base.